C.K Magma, the award-winning brand from C.K tools, has extended its 28-strong collection of premium fabric storage and Personal Protective Equipment (PPE) products with the introduction of three sets of highly functional and extremely durable knee pads. The C.K Magma knee pad range comprises of two premium sets of gel knee pads – Gel Extreme Premium Quality Knee Pads and Gel Freestyle Premium Quality Knee Pads – both tested according to EN14404, and in addition, all design has been revised to ensure these two products also comply with the latest and most up-to-date quality assured A1 standard, recently introduced in 2010. The innovative C.K Magma Gel Extreme Premium Quality Knee Pads feature a unique ribbed gel cushion with an integral air cell for maximum comfort. A detachable cap when removed also reveals a puncture resistant fabric layer for increased protection, which is ideal for working on flooring that may be susceptible to scratching and scuffing such as wooden/laminate flooring. 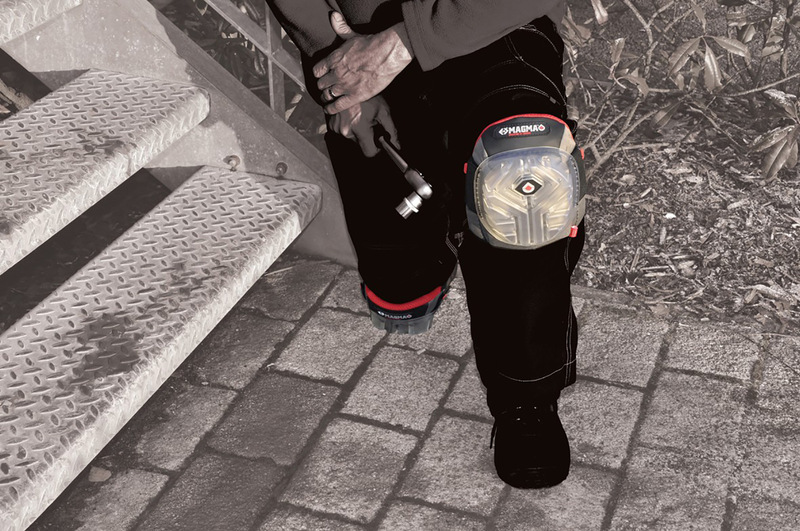 The rugged all-terrain design provides both durability and increased stability whilst working on uneven surfaces, whilst the detachable, heavy-duty cap makes these groundbreaking knee pads ideal for both internal and external applications. Where freedom of movement on the job is essential, the C.K Magma Gel Premium Quality FreeStyle Knee Pads will provide great flexibility. The pad benefits from a memory foam gel cushion with an integral air cell that keeps knees fully protected, whilst its large, smooth swivel cap allows for easy movement taking the pain out of prolonged installation work. The premium storage brand has also introduced Pro-cap kneepads to the C.K Magma range. This entry level safety equipment complies to exactly the same standards as the gel products, even the most up-to-date A1:2010 standard but is simply marketed at a lower cost – perfect for those who seek a more cost-effective product without compromising on quality. Vanessa Troupel, C.K Magma brand manager commented: “We work closely with a dedicated team of professional tradesmen to better understand their everyday working requirements Feedback revealed a need for products to keep knees protected in all working environments whilst providing maximum comfort in use. And with such high numbers of tradesmen suffering from musculoskeletal disorders, especially in the knees, a suitable range of hardwearing and flexible knee pads was essential. We are also fully committed to maintaining the highest industry safety standards, and so take great lengths to ensure our products remain fully compliant at all times, and to keep abreast of the latest developments.